A wise hockey player would choose Asics for the upcoming 2017/18 season with a brand new stunning range of hockey shoes. 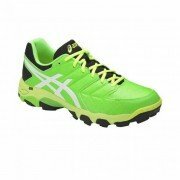 Check out the stylish array of Asics hockey shoes in our stores or online. Built for looks, comfort and high performance. Asics men’s hockey shoes and Asics women’s hockey shoes are available with some bold aesthetics to help you stand out from the crowd. The striking new Asics Typhoon 3 in both a mens and womens style are sure to make you stand out whilst on the pitch. Sprint, stop and change direction fast with a moulded, high-grip outsole, while the new vamp construction frees up the forefoot, making you more agile. New and improved versions of the Asics Blackheath 6 have been designed with a Speva mid-sole for increased comfort and responsiveness. Engineered to work with you as you run on the field, they offer the grip and stability you need to show off your stickwork. The Asics Gel-Lethal MP 7s borrow inspiration from trail-running to blend comfort and traction with an added pivot point for improved agility. 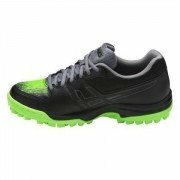 Ideal for casual players, these lightweight, flexible hockey shoes for men give you the edge when it comes to agility. 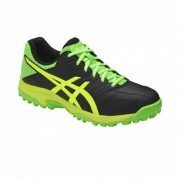 Asics Astros have been designed with all the latest technologies which have produced one of the best hockey trainers on the market today. 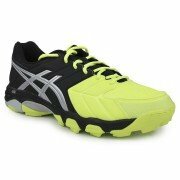 At All Rounder Hockey we have a fantastic relationship with Asics meaning we get access to all the latest hockey footwear and can pass any deals on to you the customer. Asics aim to be the number one hockey shoe brand and pledge to produce the best quality products, pushing boundaries and building upon any technological advances. 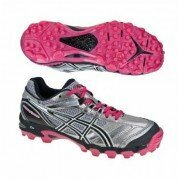 Asics have been developing sports footwear for over 50 years which has led to some innovative products and technologies including the core GEL cushioning system and the impact guidance system which have helped to create some of the most comfortable and durable hockey shoes in the market.